Geeta Hippie clothes. Geeta Bohemian clothing. Artsy clothing for expressive women! Since 1972 Geeta of India has lead the way in creating classic gypsy hippie chick bohemian shabby chic styles for women and juniors. Handmade boutique styles at affordable prices. 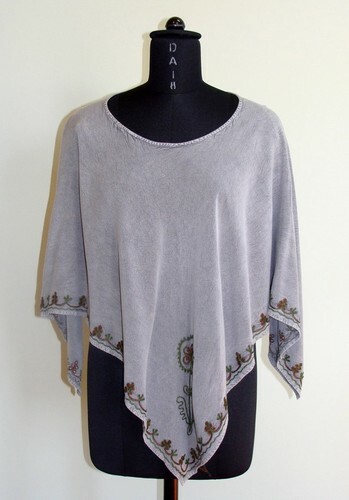 100% stonewashed rayon peasant gypsy poncho with beautiful embroidery throughout the front and back. Pullover styling. This is a great accessory for any hippie bohemian wardrobe. Check the measurements below.